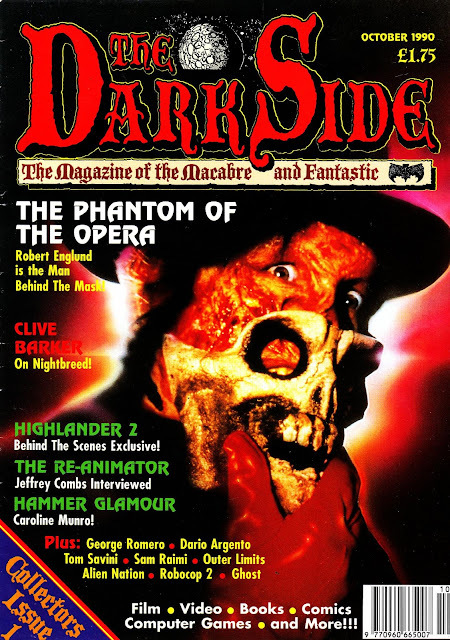 From October 1990: the first issue of the long-running (and still in business today) British horror magazine THE DARKSIDE. Edited forever by Allan Bryce, it has managed to survive the collapse of Robert Maxwell's publishing empire and nose diving magazine sales (it went on an extended hiatus between 2009 and 2011) to become one of the few survivors on WH Smith's diminishing Film and TV shelf. The best part of flicking through random back issues (if you can survive the sometimes shoddy layouts) is finding the old video adverts and reviews from deep in the VHS era. How many long-forgotten Nineties goodies (or should that be baddies?) never graced the shiny disc?